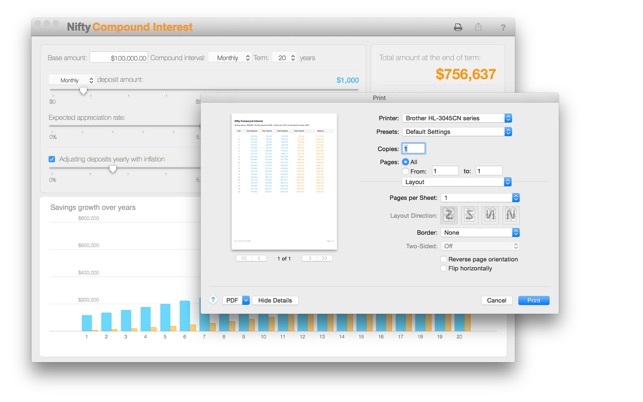 Work out the compound interest on your savings with this simple but feature-rich calculator. This calculator supports a full range of compound intervals: daily, weekly, monthly, quarterly, semi-annual and annual. 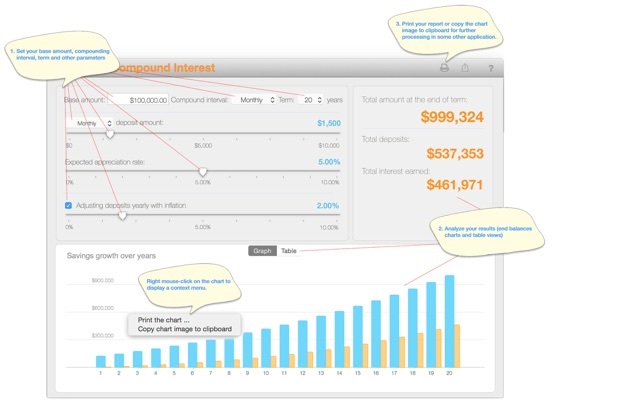 Compound interest - interest calculated on the initial principal and also on the accumulated interest of previous periods of a deposit or loan. 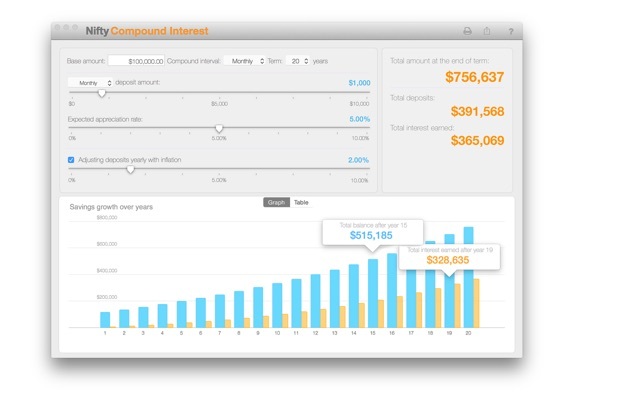 Compound interest can be thought of as “interest on interest,” and will make a deposit or loan grow at a faster rate than simple interest, which is interest calculated only on the principal amount. 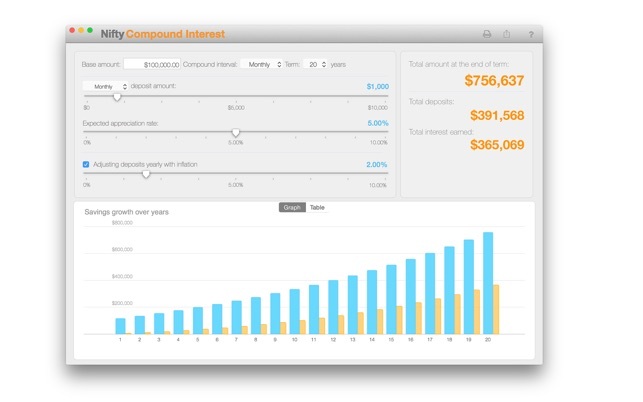 The rate at which compound interest accrues depends on the frequency of compounding; the higher the number of compounding periods, the greater the compound interest. Thus, the amount of compound interest accrued on $100 compounded at 10% annually will be lower than that on $100 compounded at 5% semi-annually over the same time period. 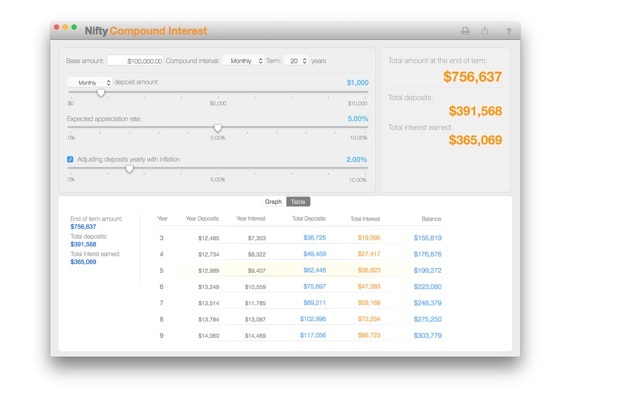 Compound interest is also known as compounding. Fixed minor issues related to display of chart labels. As EricJ pointed out, you can't specify an exact value - sometimes the slider jumps from one value to another across a range that the user has no control over. As this is a pretty basic requirement for something like a calculator, I am disappointed. Seems like the team focused on a pretty UI over functionality that should be a BASIC REQUIREMENT for a product calling itself a calculator. Nice interface, but needs to allow you to type in the values rather than just slide the dial over. 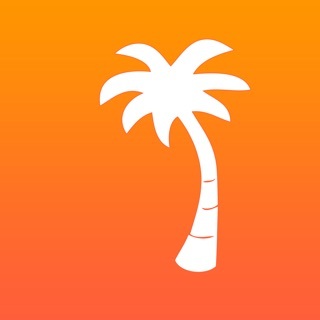 Very difficult to slide to exactly the right number—especially on the monthly deposit dial.